Our favourite server/hostess there, Michelle, explained that there are no identical sea urchins. The shell can be of different shapes (oblong or round), the sea urchin slices can be of different colours (and the colour is no indication of the actual taste. Darker doesn’t mean better taste or vice versa) and different sizes. How was ours? It was oblong, light yellow in colour, and the meat slices were fresh, sweet and gigantic! What you see in the picture above cost us $19.99 and it’s priced decently given it’s fresh off the water. Nigiri sushi with sea urchin slice size half of the ones above would cost $4 each. The freshness of the sea urchins makes a huge difference in taste. Fresh sea urchin has a strong, refreshing taste and it’s often sweet. It just melts in your mouth!! When it’s not fresh, it could get bitter, fishy and really mushy. Either way, sea urchin meat (aka roe) is mushy in texture but fresh ones appear to be more coral-like while old ones would have smooth, mushy look. Not everyone likes the taste and texture of sea urchin and I used to be one of them. And then I learned to appreciate it, and of course, after I found out that my first impression of sea urchin was formed by days-old sea urchins. Thankfully I was willing to give it a second chance and the second time around the fresh sea urchin changed my mind. Perhaps this is the season to get fresh uni. 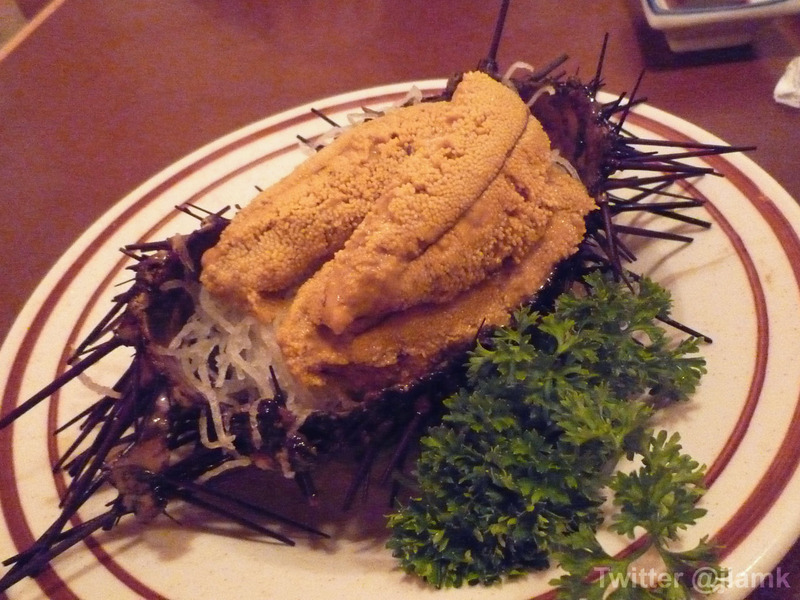 This is a Jap restaurant that we often go to, but it’s not easy for us to come across fresh uni at this place. Well, they have fresh uni, sort of, as most of the times it comes in those containers instead of the actual thing. Anyways, pricey item, but worth the money for a little treat! OMG that’s really the freshest you can ever get! But I’m often hesitant to just eat any seafood fresh out of water. You’re lucky that you didn’t have stomach ache! Interesting..I went to Coast and tried their 3 basic ones, New England, Manhattan and Smoked. Personally I like the Smoked one the best (out of the 3). I will have a blog post about it soon.